Most people around the globe think of America as a great “capitalist” economic machine, but the truth is that the U.S. financial system is essentially one massive betting parlor at this point. In fact, there has been a whole lot of easy money made in this betting parlor over the past several years by our politicians and by the big financial players down on Wall Street. So how did they make all of this money? They did it by betting against America. By betting that the U.S. economy would do badly, a lot of very powerful people have gotten insanely wealthy. Literally billions of dollars have been made over the past five years simply by betting that the U.S. housing market would go into the toilet. But is all of this “short selling” and are all of these “side bets” actually good for the American economy? How is the U.S. economy supposed to succeed when the big banks and so many of our politicians are actively making bets against it? Just take a moment and check out some of the folks that have been betting against America…. *A Wall Street Journal analysis of congressional disclosures shows that 13 members of the U.S. Congress or their wives were engaged in substantial short selling  during the financial crisis of 2008. *An individual by the name of Jeff Greene made hundreds of millions of dollars  during the real estate collapse by making huge bets against the residential housing market. Now he wants to use some of that money to run for the U.S. Senate in Florida. *Goldman Sachs openly and brazenly bet against its own clients  as the housing market began to implode back in 2007 and 2008, and they made a TON of money by doing so. *John Paulson (with the assistance of Goldman Sachs) has quickly become one of the richest men in the United States by betting against America. Shorting the subprime mortgage market enabled his firm, Paulson & Co., to make 15 billion dollars in 2007 . John Paulson alone made approximately 4 billion dollars that year. *Legendary investor Warren Buffett said on Saturday that he’s bearish  about the ability of all currencies to hold their value over time because of massive deficits being run up by governments in the wake of the global financial crisis. *The Federal Reserve holds credit-default swaps on the debt of Florida schools, and on debt owed by the states of Nevada and California. So the Federal Reserve would profit  if one of those states defaulted on its debt. *JPMorgan Chase, Bank of America, and Citigroup are offering “municipal credit default swaps”  that enable investors to make big money if U.S. states and cities end up defaulting on their debts. It is one thing to make a legitimate profit on an investment. It is another thing entirely for the biggest financial institutions in the United States and our politicians to be making massive amounts of money off of the economic collapse of America. You see, those making huge bets against the U.S. economy also have an incentive to do what they can to make those bets profitable. So for those who have the power to do so, does there come a point where they give the U.S. economy a little “push” in the wrong direction so that their bets will pay off? The reality is that we have created a financial environment where fear rules. For example, very few people want to back U.S. home loans anymore. So now the U.S. government has to do it. According to Inside Mortgage Finance, U.S. government-related entities backed 96.5% of all U.S. home loans  during the first quarter of 2010. This was up from 90% in 2009. We should really rethink a financial system where a few people make a ton of money off of the fact that everyone else is doing badly. Sure a few people are laughing all the way to the bank, but America as a whole is hurting. Just consider the following charts. 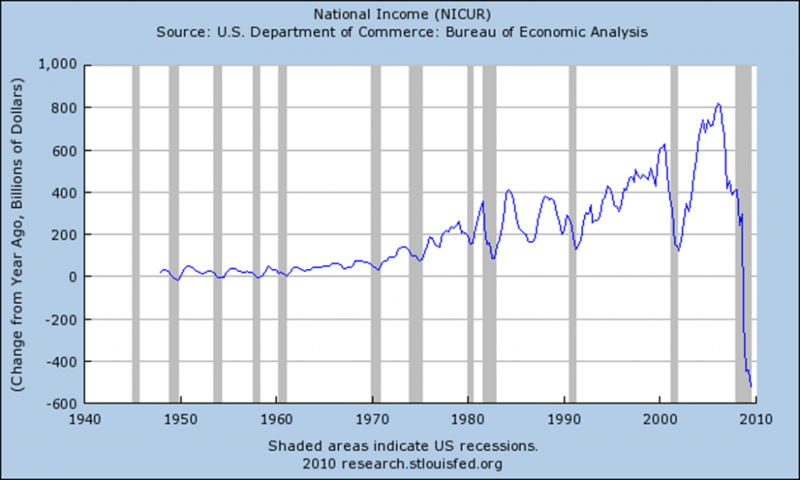 U.S. national income has never experienced such a radically negative change in modern times…. 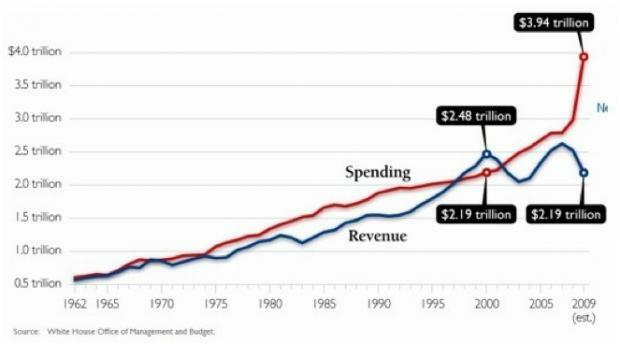 All of these economic problems have caused the revenue of the U.S. government to dramatically decline at the same time expenditures are rocketing into the stratosphere…. As the U.S. economy continues to tank, the U.S. national debt is going to keep spinning wildly out of control. 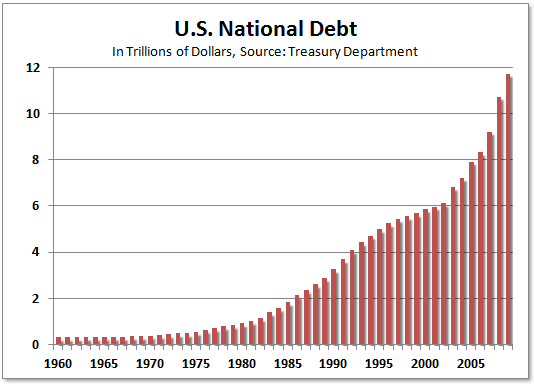 Back in 1980, the U.S. national debt was approximately 1 trillion dollars. Today it is accelerating rapidly as it pushes past 12 trillion dollars and towards 13 trillion dollars…. The truth is that the massive deficits being run up not only by the U.S. government, but by governments all over the world, are something that is clearly not sustainable. In fact, Warren Buffett recently made an interesting remark  about how painful it is going to be when the debt party ends…. In fact, there are some nations that are in bigger trouble with debt than even the United States is. Japan’s gross public debt has reached 201% of GDP , and the only way that the government of Japan can avoid bankruptcy at this point is by borrowing ever-increasing amounts of money. But the truth is that this game cannot be played forever. There has never been a time when so many nations around the world have piled up so much debt so quickly. When the sovereign debt bubble pops, things are going to get really messy and the dominoes will start falling really quickly. But when that happens one thing is for certain – there will be a lot of people ready to make a lot of money by betting on the financial failures of others.